Written by sheldon on August 16th, 2016 September 12th, 2016 . Now before you get offended or start writing an angry response just take a deep breath and read what I am suggesting. If by religion you mean, “an organized system of beliefs, ceremonies, and rules used to worship a god or a group of gods” then okay, some of you aren’t religious. That’s fine. But that’s not what I mean. If by religion you mean, “a pursuit or interest followed with great devotion,” then I think more of us are religious than we realize. Sports, celebrities, craft-beer, coffee-snobbery, shopping, travel, and our children are just a few of the many things we are religious about. Try to get a Manchester United fan to change their allegiance and you will witness religious fervor like nothing else. As humans we are creatures of desire. We set our affections towards certain pursuits and we follow them with religious intent. Usually our affections are set upon what we think makes up a certain vision of the good life. Being in a good job, having the right bank balance, looking the right way, dating the right person or even experiencing adrenaline rushes on a weekly basis are just a few of the things we can desire because they fulfill our idea of what life is all about. We’re religious about them. We love them. We give our time and effort to achieve them. We find our meaning and purpose in them. But there’s another definition of religion and it goes back to the meaning of the Latin words religare (which means to bind) and religio (which means and obligation, bond or reverence). Religion is about binding up the pieces of our life, making sense of the different fragments of experience and trying to understand our brokenness. Religion is the obligation we feel to ourselves to make sense of the world we live in, to understand why things don’t work how they should, why there is an emptiness even after great accomplishment and how to become fully alive as a human being. In a broad sense, all of our religious pursuits, be they traditional, financial, social, sexual or mental are focused on trying to put the pieces of our lives back together. This is what the great religions of the world offer. This is what secularism, humanism and all the great -isms of the world offer. This is what science, philosophy, economics and other great areas of academia offer. A sense of trying to figure it out and fix what’s broken. And this is why all religious activity will fail. Because we can’t do it. We can’t fix ourselves. Once we are broken as humans we can’t be fixed. 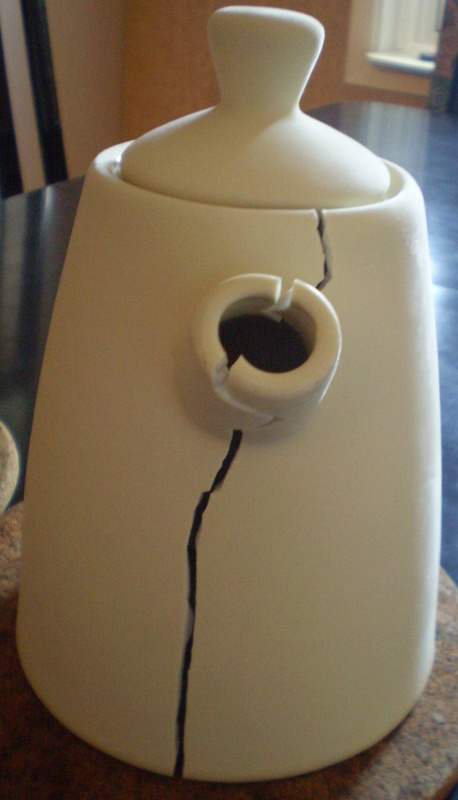 We are liked cracked teapots that have been tediously glued back together. Even though we’ve spent years pursuing the best and strongest adhesive to put the fragments back into place, we find it doesn’t work. It doesn’t look right. The teapot still leaks. The cracks and scars are visible. It’s futile. Some people get that right away while others try to ignore it. But for many of us we don’t want to believe it and so we religiously pursue the next great guru, theory, philosophy or product that offers the good life. We are looking for the next quick fix. But I would suggest that we don’t need to be fixed. Instead we need to be made new. This is why I am a follower of Christ. This is why my religion is the pursuit of and devotion to Jesus. Because he doesn’t try to fix me. He doesn’t take my brokenness and try to glue me back together. He doesn’t take the smashed fragments of my pain, failure and sin and try to make a mosaic out of them. No. He makes me new. He gives me a brand new life and brand new hope. I am a new creation. A new teapot. A better teapot. Everyday. Over and over again. That’s why my pursuit of Jesus matters because the more I follow him and set my affections upon him, the more I become like him. The more I become like him, the less I need other religious pursuits to give me meaning, purpose or fulfillment. My desires change. My vision of the good life doesn’t shrink but expands. I see the world in colour. I see people as beautiful creatures. I have an obligation to invite them to be made new. So, I would suggest that we are all religious, we are all looking to bind up our lives into something that makes sense. We are all trying to fix ourselves. My invitation to you is this. Don’t get fixed instead be made new. Don’t settle for a cracked life that leaks but instead find the one who can give you even more than you ever dreamed.